Imagine that you’ve just arrived home from a vacation where everything that could have gone wrong did. Your all-to-cheery sister wants to hear all of your stories and see all of your pictures, but all you can do is vent: “Firstly, we missed our flight on the way there. Secondly, the hotel couldn’t find our reservation and was completely booked. Thirdly, it rained the entire time.” Unimpressed with what she just heard, your sister turns to you and says “if you’re so exhausted from your ‘depressing’ vacation, the least you could do is use better transition words to save yourself some energy.” Stunned, you wonder what in the world she’s talking about. We’ll explain it all in today’s post on when to use firstly vs. first. When can you use firstly vs. first? If you can always use firstly vs. first in a sentence, why did your sister make such a big fuss about what you said? You can’t figure it out, so you ask her. When should you use firstly vs. first? When you ask your sister why she objected to your use of firstly vs. first, she tells you this: just because you can use firstly vs. first in any sentence doesn’t mean you should. Yes, both firstly and first are grammatically correct choices for a sentence. But that doesn’t mean that they’re both good choices. (Remember our post on when to use before vs. prior to? It’s the same idea). First (see what she did there? ), firstly means the same thing as first, but it’s longer. 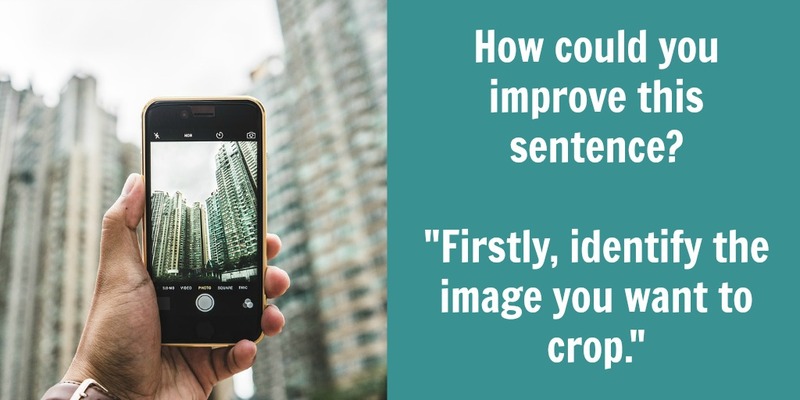 When you use firstly vs. first, it adds unnecessary length to a sentence. Keep text short and sweet by using first instead of firstly. Remember, you want to impress people with your ideas not with the length of your words. Second, the –ly forms of number words get awkward once you get up to a certain number (e.g., tenthly and eleventhly). You don’t want to sound awkward, do you? So avoid using firstly and its equivalents. A grammar lesson wasn’t exactly what you had in mind after arriving home from what was supposed to be a relaxing vacation. But at least now you know when to use firstly vs. first in a sentence: never! Both words mean the same thing, but first is shorter and easier to scale to larger numbers. Give your sister a story about a bad vacation and suboptimal word usage, and she’ll turn lemons into lemonade. Looks like you’ve got one more reason to hate her. Want to read about other ways to tighten your copy? Check out our post on when to use before vs. prior to.